We’d love your help. 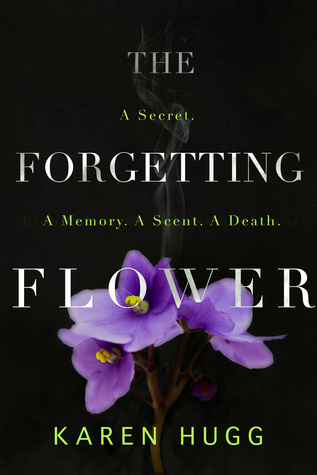 Let us know what’s wrong with this preview of The Forgetting Flower by Karen Hugg. All too suddenly, the City Secrets and half-truths. These litter Renia Baranczka’s past, but the city of Paris has offered an escape and the refuge of a dream job. The specialty plant shop buzzes with activity and has brought her to a new friend, Alain. His presence buffers the guilt that keeps her up at night, dwelling on the endless replays of what happened to her sister. To ask other readers questions about The Forgetting Flower, please sign up. Paris, people, plants, passion—irresistible! Le Sanctuaire, an alluring botanical boutique in the Parisian literary and shopping mecca of Saint Germaine des Pres, has a secret carefully guarded and nurtured by its caring and conflicted manager, Renia. Renia’s past and present conspire to expose her secret, tempt her frailties, and threaten her family, friends, and once idyllic Parisian life in this well-crafted novel. Check it out! A fun read set in Paris. It’s a thriller from the first pages when a body is discovered but it’s more layered than a straight mystery/thriller with questions about the plant’s origins, issues of memory and morality, and an interesting back story about Renia’s sister. As the action builds in the present, the questions about the past are answered until both stories come together for a satisfying end. It definitely held my attention and the premise is original. I’ve never read a novel where a plant A fun read set in Paris. It’s a thriller from the first pages when a body is discovered but it’s more layered than a straight mystery/thriller with questions about the plant’s origins, issues of memory and morality, and an interesting back story about Renia’s sister. As the action builds in the present, the questions about the past are answered until both stories come together for a satisfying end. It definitely held my attention and the premise is original. I’ve never read a novel where a plant is the star of the story. And I liked that Renia was a Polish transplant in Paris trying to make a better life. Unusual profile for a protagonist. I also read Song of the Tree Hollow, the author’s bargain book. Of the two, this one’s better. More speculative and less paranormal. If you want to go to Paris this summer but you can’t afford a flight, read this instead. It brings to life more than just the touristy districts. Highly recommended. Karen Hugg writes literary mysteries and thrillers inspired by plants. Her stories are set in worlds where plants, real or imagined, affect people in strange new ways. Her background is in horticulture and her passion is living green things. Her aim is to entertain and inspire readers, to get them thinking while their hearts are pounding. She's a certified ornamental horticulturalist and Master Pr Karen Hugg writes literary mysteries and thrillers inspired by plants. Her stories are set in worlds where plants, real or imagined, affect people in strange new ways. Her background is in horticulture and her passion is living green things. Her aim is to entertain and inspire readers, to get them thinking while their hearts are pounding. She's a certified ornamental horticulturalist and Master Pruner. She's also a graduate of the Goddard MFA program. When not digging in the dirt she writes.